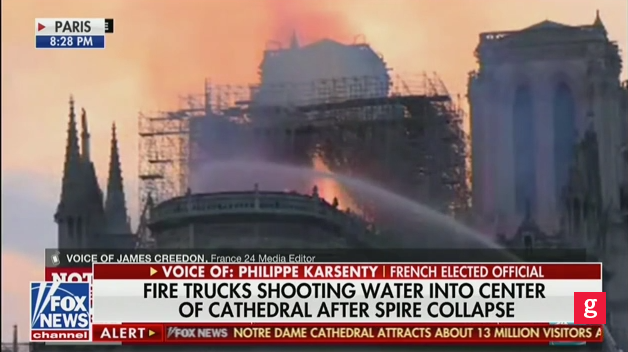 Fox News’ Shepard Smith on Monday shut down Philippe Karsenty, a prominent French political gadfly, for suggesting the fire consuming Notre Dame was deliberately set. “I’m just telling you something, what we need to be ready — ” Karsenty protested, but Smith shut him down completely, hung up the phone, and proceeded to publicly call out his guest as a liar. Karsenty has a long history of problematic statements. He was convicted of libel in 2013, and after investigators discovered “funding irregularities” in his campaign for office in 2013, he was banned from running again for a year. On Monday, Bill Donohue of the Catholic League told Fox News host Neil Cavuto that he was “suspicious” regarding the Notre Dame fire. The Notre Dame Cathedral in Paris caught on fire. Authorities are still investigating the cause of the fire, and as of now, zero casualties have been reported. “It’s a monumental tragedy. Forgive me for being suspicious. Last month, a 17th-century church was set on fire in Paris. We’ve seen tabernacles knocked down, crosses torn down, and statues,” Donohue said. “We don’t know that. If we can avoid what your suspicions are. Now I’m wondering how much more the Catholic Church commits to this or do you think they first want to get to the bottom of it?” Cavuto said. “First, they have to get to the bottom of it. They will rebuild it. There’s no question. I’m sorry. The Eucharist is being destroyed and excrement smeared on crosses,” Donohue said. “We cannot make conjectures about this. I’m sorry. Thanks very much. I do want to let people know, we’re not trying to be rude to our guests. There’s so much we don’t know,” Cavuto said. How about not booking right wing nut jobs during a breaking story? It’s … unwise.